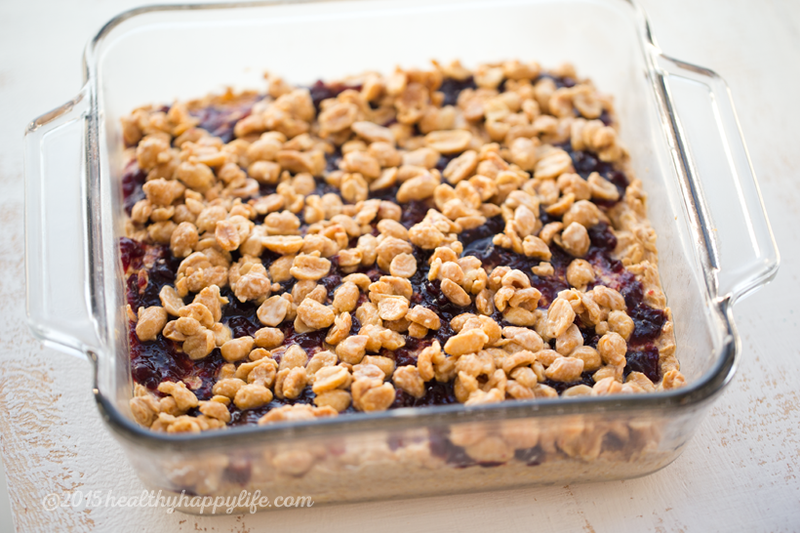 Peanut + Jam Bars! with Whole Grain Oats. 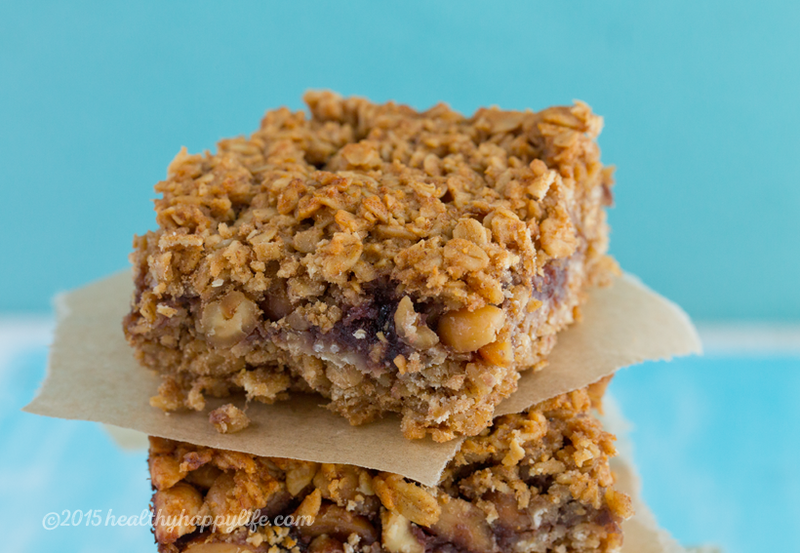 These jam and nut-filled bars are the perfect after-school snack, fiber-ful dessert or anytime treat. 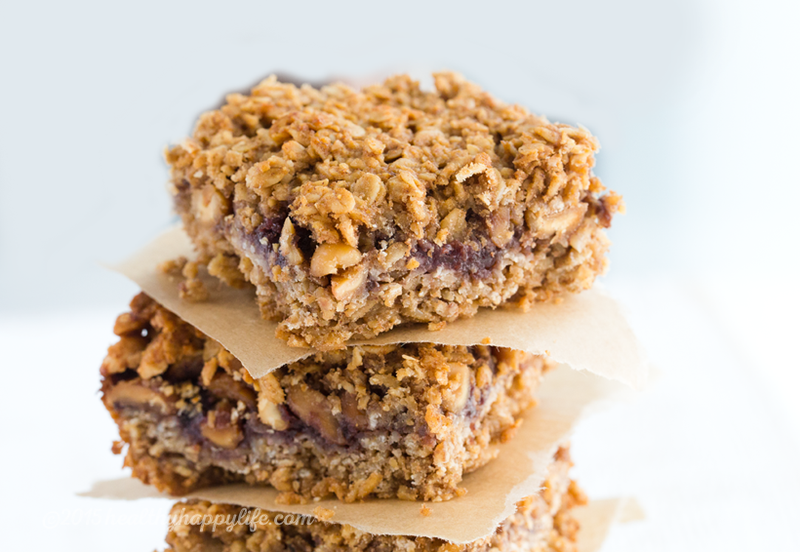 Packed with whole grain oats, sweet fruity jam and chopped peanuts (though you could use any nut), these Peanut & Jam Oatmeal Bars, aka PBJ Bars, are a fun and easy baking recipe. Bake these bars, share them with your friends and have a very sunny snack time!.. bars before adding the top layer of batter and baking.. I feel the hum of back to school in the air, so I wanted to share this recipe because PBJ always reminds me of my days as a JanSport backpack wearing kid, rushing home after school to rummage through the pantry to pull out snacks or to make my own. Peanut butter and jam on saltine crackers with apple slices was a common DIY fave of mine, as I recall. So today's recipe is a baked spin on that, providing some hearty, sweet treat snackage to all the families out there currently entangled in the back to school buzz. But really these bars, are for everyone. 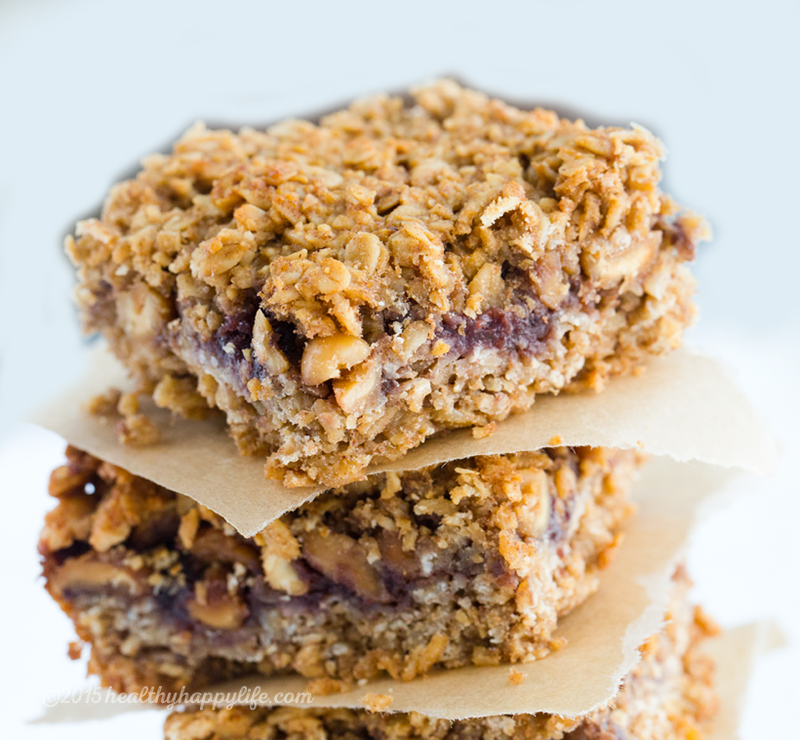 These tender, crumbly bars have a sweet peanut butter and jelly-ish flavor, and loads of complex carbs from the whole grain rolled oats. I didn't want a thick layer of peanut butter to weigh down the bars, so I instead used a layer of crumbly chopped peanuts to get that peanut flavor. You could easily use chopped almonds, walnuts or even sunflower or pumpkin seeds for allergy sensitivities. 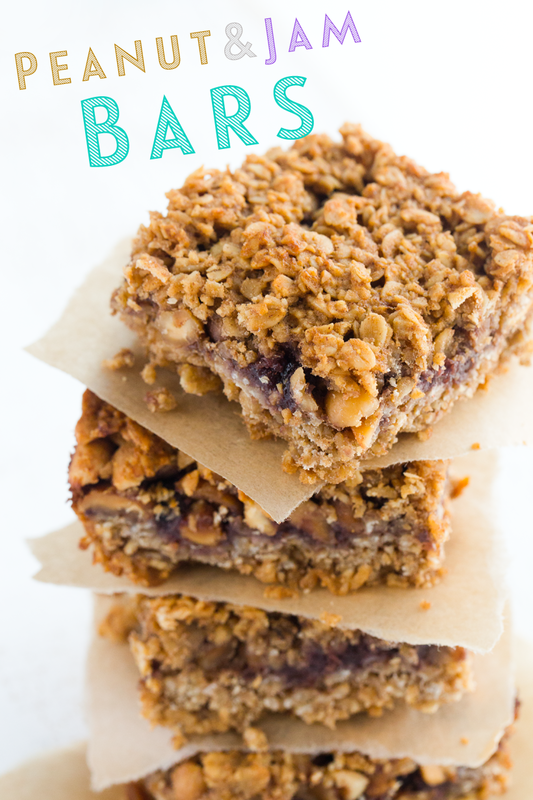 These bars are vegan + gluten-free + happiness-inducing. ps. Wearing my HHL tee above .. coziest tee and I just love them. If you still want one, I relaunched the campaign - they will ship only if enough tees sell. 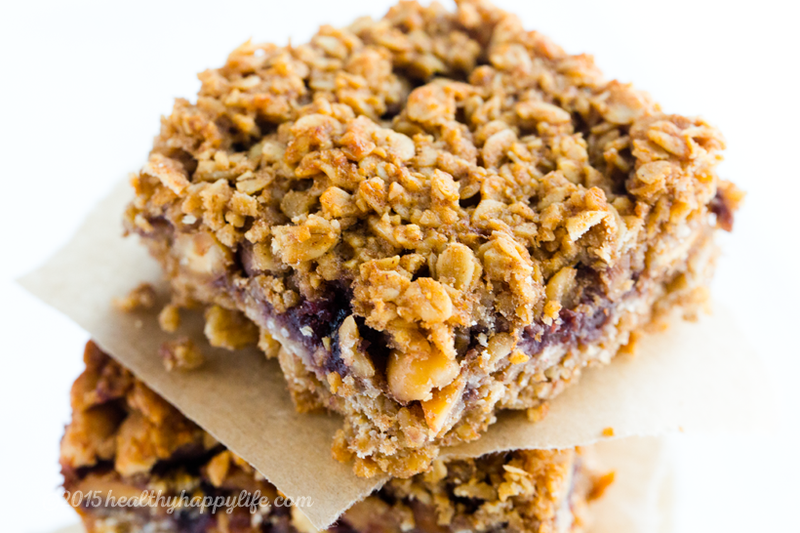 These crumbly, moist, baked square are peanut butter and jelly flavored, with some granola bar appeal built in. Perfect for a snack or treat. Kid-approved! Preheat the oven to 350 degrees and grease and 8x8 square baking dish. Add all the 'dry' ingredients to a large mixing bowl and toss well. Add the 'wet' ingredients to a blender and blend until smooth and silky - the mixture will look like a thick yellow pudding in texture. Pour the wet into the dry bowl and stir well, until a textured oat batter forms. Scoop about 2/3 of the batter into the baking dish and flatten with a spatula. Warm the jam and coconut oil in a small dish in the microwave - or on the stovetop. You want the coconut oil melted and the jam to be soft and spreadable. Stir these two ingredients briskly together, then pour the jam on the bottom layer of batter, smoothing gently. Add the chopped peanuts over top the jam. Note: I "chopped" my peanuts by processing them in my Vitamix for about thirty seconds. A food processor can also be used - or simply chop using a knife. Pour the remaining batter over top the jam and peanuts and smooth. Bake at 350 degrees for 25-35 minutes, or until the edges begin to brown. Remove squares and cool for at least an hour before slicing and serving. They are easiest to slice when they are fully cooled or chilled in the fridge. Serve at room temperature - and store in the fridge for up to a week. ps. Do not forget to enter to win prizes + vote in the veggie awards! I am up for three awards! details.